You wouldn't believe it, but Peek-a-BooK won his 2nd award! For this one I really have to thank Danielle of "Enchanted by books", a very interesting blog that I recommend to all of you! Mi sembra quasi impossibile, ma Peek-a-BooK ha vinto il suo 2° award! Per questo devo ringraziare tantissimo Danielle di “Enchanted by books”, un blog molto interessante che vi consiglio di visitare! 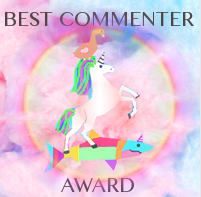 This award (created by SJ of the blog "Snobbery") goes to the 5 readers that left more comments on your blog and, as a matter of fact, I ranked fifth on Danielle's blog! Questo award (creato da SJ del blog “Snobbery”) premia i 5 lettori che hanno lasciato più commenti sul vostro blog ed io sono per l'appunto rientrata nella top 5 dei commentatori del blog di Danielle! In addition to showing the comment love (and using the awsome graphic) each recipient (who wants to accept the award) must answer the following 9 questions and then pass the award on their top 5. Oltre a dimostrare di aver gradito il premio (utilizzando l'immagine relativa all'award) ogni premiato (se accetta) deve rispondere alle seguenti 9 domande e poi passare l'award a sua volta ai suoi primi 5 commentatori. 2. Would you rather be: a Jedi, a Pokemon Master or a Wizard/Witch? Choose ONE. I love witches! Preferiresti essere: uno Jedi, un Mater dei Pokemon o un mago/strega? Segliene uno. Adoro le streghe! 3. Who is your favourite Doctor? The forensic anthropologist Temperance Brennan of course! She is the main character of the books by Kathy Reichs. Chi è il tuo dottore preferito? Sicuramente l'antropologa forense Temperance Brennan! E' la protagonista dei libri di Kathy Reichs. 4. Can you whistle? Yes, I am actually really good at it! Sei capace di fischiare? Sì, e sono anche molto brava! Quale è la risposta alla Vita, all'Universo, a Tutto? I gatti! Thank you so much! I've passed the commenting love along to five more wonderful women.